Peppers are another excellent addition to your food garden! If you live in Florida, plant Peppers in January thru early March. There are a few varieties that can grow year-round in the Florida heat. For cooler climates, Start seeds indoors under bright fluorescent lights in early spring, eight weeks before your last spring frost date. If possible, provide bottom heat to keep the plants' containers near 80 degrees Fahrenheit. Make sure the seeds stay slightly moist. Seeds should sprout within three weeks. Transfer seedlings to larger containers when they are about six weeks old. 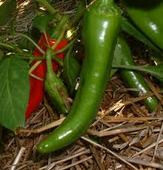 Don't set peppers outside until at least two weeks after your average last frost date, during a period of warm weather. Always harden off seedlings by gradually exposing them to outdoor weather a few hours each day for at least a week before transplanting them outdoors. If you have don't have a short growing season and you're willing to wait, you can always plant seeds outside after your last risk of frost. Peppers need warm weather to germinate and survive. I recommend soaking your seeds in water for up to 24 hours. This has increase the amount of seeds that germinate and how quickly they sprout. Use organic potting soil if you are seed-starting indoors or in small containers to be transplanted outside. Whether you direct sow or plant in containers, plant pepper seeds approx 1/4 inch below the soil. Pepper seeds germinate in as few as 7- 21 days. ANAHEIM PEPPER is my favorite! All peppers grow best under warm conditions, but gardeners in cool climates can keep peppers happy by using row covers. Choose a sunny site that has fertile, well-drained soil with a pH between 6.0 and 6.5. Loosen the planting bed to 12 inches deep, and thoroughly mix in a 1-inch layer of mature compost. Dig planting holes 12 inches deep and at least 18 inches apart, and enrich each with a spadeful of additional compost. Partially refill the holes, and situate plants so they are planted slightly deeper than they were in their containers. Water well. You can eat peppers when they are mature yet still green (green peppers), although the flavor and the vitamin content of peppers improve as they ripen to red, yellow or orange. Use pruning shears or scissors to snip ripe peppers from the plant, leaving a small stub of stem attached. Bumper crops can be briefly steam-blanched or roasted and then frozen, either whole or chopped. Peppers are also easy to dry. Dried peppers quickly plump if soaked in hot water, or you can grind them into powders for your spice shelf. Be careful with nitrogen when preparing your planting holes, as overfed peppers produce lush foliage but few fruits. Use a high-nitrogen fertilizer only if you're growing peppers in poor soil. In cool climates, use black plastic mulch in addition to row covers to create warm conditions for peppers. In warm climates, use shade covers during summer to reduce sunscald damage to ripening peppers. Provide stakes or other supports to keep plants upright as they become heavy with fruits. Cover surrounding soil with a mulch of clean straw or grass clippings so ripening peppers don't come in contact with soil, which can cause them to rot. Always wear gloves if handling hot peppers, and avoid touching your eyes or nose. If you do handle hot peppers bare-handed, immediately scrub hands with soap and warm water, rub them vigorously with coconut oil, then wash them again. Tobacco etch virus (TEV), cucumber mosaic virus (CMV) and potato virus Y (PVY) can infect peppers grown in warm climates. Transmitted by thrips and aphids, these viruses cause leaves to become thick, crinkled or narrow and stringy. Margined blister beetles may suddenly appear in large numbers in midsummer, especially in warm climates. These large beetles are black with gray stripes, and they devour pepper foliage. Handpick beetles, making sure to wear gloves to prevent skin irritation. Pepper weevils can also be a serious problem in warm climates. Clean up fallen fruit daily to interrupt the life cycle of this pest, and trap adult pepper weevils with sticky traps. Diatomaceous Earth is another great Organic solution to pest control. DE kills aphids, white flies, beetles, loopers, mites, snails, slugs, leaf hoppers, and harmful pests. Sprinkle DE around the base of the plant as well as on the leaves. Tomatoes, parsley, basil, geraniums, marjoram, lovage, petunia and carrots. Onions make an excellent companion plant for peppers. They do quite well with okra as it shelters them and protects the brittle stems from wind. Chili peppers have root exudates that prevent root rot and other Fusarium diseases. Plant anywhere you have these problems. Hot peppers like to be grouped with cucumbers, eggplant, escarole, tomato, okra, Swiss chard and squash. Herbs to plant near them include: basils, oregano, parsley and rosemary. Never put them next to any beans, broccoli, cabbage, cauliflower, Brussels sprouts or fennel. Below you will find a list of Helpful Links!